We just got WowWee’s RS Media in stock! As we’re sure you already know, this is the newest incarnation of the revolutionary Robosapien series, and it’s clearly the most advanced robotic media appliance on the consumer market. I don’t even know where to start. First off, it’s huge. Well, it’s 23 inches tall, which may not sound that huge, but it’s pretty imposing. If you stood him on a stool in the middle of a room full of dancing badgers, nobody would pay attention to the badgers. That’s right. Hello, sir. Please don’t hurt me. 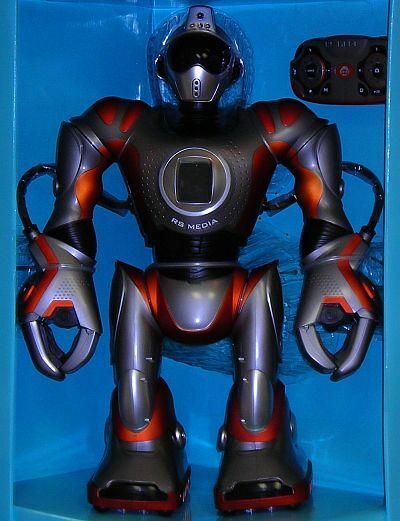 We’re glad that WowWee finally strayed from the white-with-black-accents motif. RS Media proves that they are no longer competing with Apple for shiny monochromatic blandness. Here’s a full shot of him, still in the box. Unfortunately, he’s going to have to stay there until we have time to give him a proper test-run. As with all WowWee products, he’s strapped into his box like a monkey ready to be shot into space. A space monkey. Seriously though, you’ll need much more than a test-run to really get the full experience. It has more amazing features than Ron Popiel’s Magic Rotisserie. For starters, it’s a really cool looking bipedal humanoid robot that’s loaded with sensors and other goodies. That, in and of itself, should have you running for your credit card. It can roam free, responding to its environment by talking to inanimate objects and ordering around your other WowWee Robo-family bots. From the remote, you can trigger demo moves, walk around using three different gaits, move his arms around, pick up and throw stuff, switch between his different personalities, and run through his various media capabilities. Let’s talk about those media capabilities. 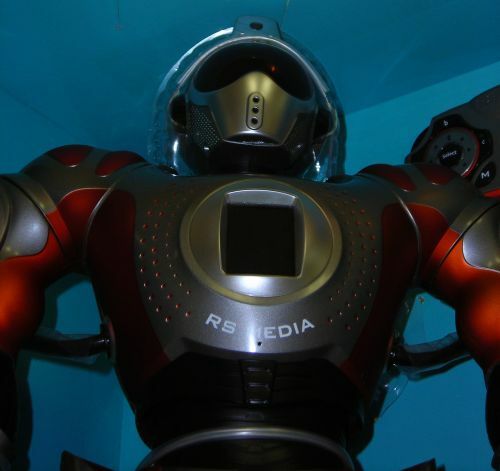 RS Media is a walking and talking MP3 player, audio recorder, still picture camera, video recorder, video player, and video game system. If he had cell phone and internet capabilities, you’d pretty much never have to buy another piece of consumer electronics ever again. Pretty much everything he does is modifiable via a slick software interface. He connects to your computer via USB, and from there you can upload and download music, pictures, videos, personalities (including new voice files), motions, and Java games. He has 40 MB of on-board memory flash memory, but you can add up to 1 GB to this by installing an SD memory card. RS Media comes packaged with several Java games (one of them resembles the old Neo Geo game "Bust-a-Move," one of the greatest time-killer games ever), and you can even upload Java-based mobile phone games! This entry was posted on Thursday, November 8th, 2007 at 10:19 am	and is filed under Announcements, Front Page News, Fun Stuff, New Kits / Products, Product Spotlight. You can follow any responses to this entry through the RSS 2.0 feed. You can leave a response, or trackback from your own site.